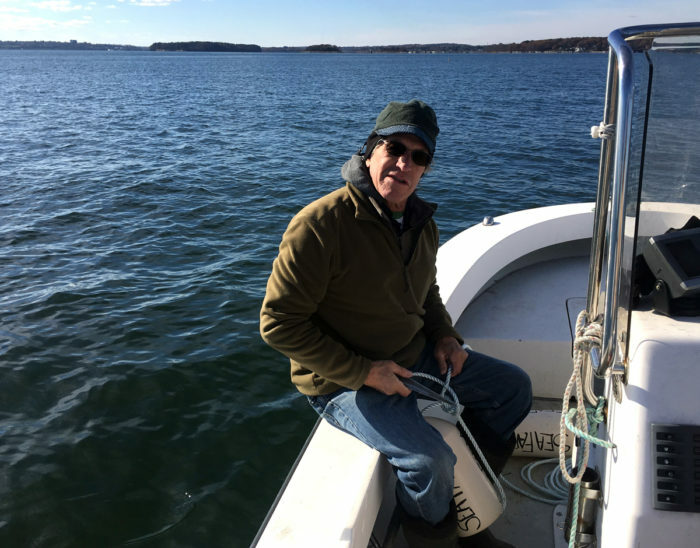 As Tollef Olsen throws a white buoy labeled “SEAFARM” into Portland, Maine’s Casco Bay on a cold, clear November day, he reminisces about talking to the Maine Sea Coast Vegetables founder Shep Erhart back in the early 1980s about the environmental benefits of farming seaweed. The growth has been partially driven by consumer demand. While seaweed has long been farmed and eaten as a dietary staple in Asia, it might finally be catching on in the U.S, particularly among health-conscious consumers, with seaweed being mentioned as a top health-food trends this year by Today.com, MarketWatch, and Whole Foods. While there are now seaweed farms in in Mexico, California, Alaska, and Connecticut, Maine in particular is stepping up to position itself as the sea vegetable state. Thanks to its curvy coastal and island-heavy geography, Maine has 3,000 miles of coastline, a large percentage of which is protected from the open ocean. In other words, there’s plenty of space for kelp to flourish without disrupting homeowners’ views, without the threat of major ocean swells, and close enough for seaweed farmers to check their lines easily every week. Most of the people already working that coastline are lobstermen, and the lobster industry is booming. “Last year was a record year, but there are concerns that with any natural resource economy, you don’t want to be too dependent on one thing,” says James Crimp, a marine business specialist at the Island Institute. To address that, the Institute created an aquaculture business development program to encourage shellfish and seaweed farming, which has since put two seaweed farmers into business and is currently training five more. 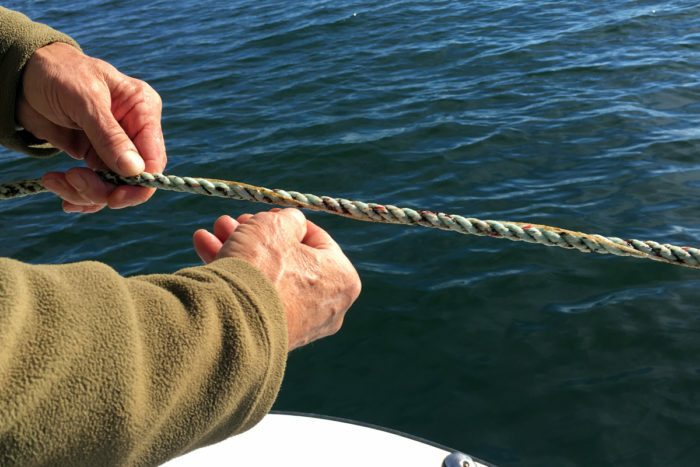 The key is that the seaweed season in Maine stretches from around October to May, which is almost the exact inverse of lobster season, making it possible and profitable to do both.” Lobstermen have some downtime in the winter, so seaweed works out great.” Crimp explains. “It’s a good way to keep your crew employed. Fishermen can start these farms with very little capital and keep on fishing,” he says. “Our entire working waterfront can prosper and be positively affected by this,” Olsen adds, and he doesn’t just mean economically. 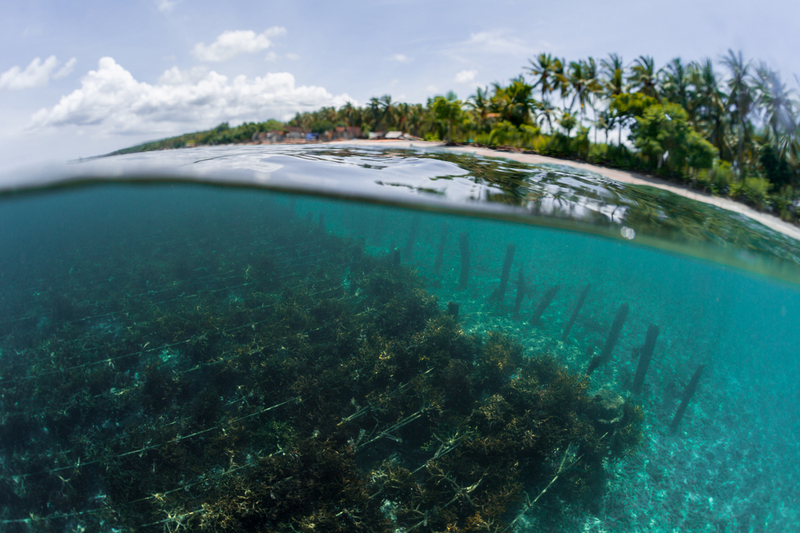 Organizations like the World Bank have proposed seaweed farming as one of the best solutions for feeding a growing global population without destroying the planet, and Barry Costa-Pierce agrees. Costa-Pierce is the director of the Center for Excellence in the Marine Sciences at UNE, where researchers and students work on an experimental kelp farm and grow sea vegetable seed in a lab (which they provide to farmers free of charge in exchange for participating in research studies). Seaweed farming fits the bill. It requires no land, no freshwater, and zero external inputs like feed or fertilizer. It doesn’t produce methane emissions or nitrogen run-off and it has the potential to mitigate ocean acidification by absorbing the carbon dioxide. Acidification happens when seas absorb humans’ CO2 emissions, threatening marine life. Researchers from Bigelow Labs have shown kelp grown in Casco Bay has absorbed enough CO2 to decrease acidification in the immediately surrounding water. The changes were significant enough that researchers say it could protect shellfish like oysters and mussels, which are also threatened by acidification. “I feel like seaweed is in many ways the most virtuous material on earth,” says Blue Evolution founder Beau Perry. Perry created Blue Evolution in 2013 to begin farming green seaweed, or sea lettuce, in outdoor ocean-fed tanks in Mexico. While his method does require a small amount of energy, he says the company is in the process of moving to solar power, to make the operation carbon negative. He also recently expanded to kelp farming in Alaska, where the offshore model is similar to the farms in Maine. Blue Evolution’s green seaweed-infused pasta products were recently highlighted as a rising food trend at the Natural Products Expo East, alongside Ocean’s Balance’s kelp puree and a line of seaweed broths. Fans of sea vegetables look to them for the perceived health benefits—they’re high in minerals, vitamins, and antioxidants—as well as the unique flavors. And chefs around the country have started to embrace the umami flavor on their menus (especially in Portland, Maine, at local food-forward restaurants like Vinland). Still, aside from the occasional sushi dinner, the vast majority of Americans aren’t used to eating seaweed with any frequency. “We realized early on that we really needed to create a retail product to tell the story and show the value to the customer,” Perry says. Researchers at the Island Institute had the same idea. While workers at the institute were training more farmers to go into seaweed aquaculture, they were doing so with caution since they there weren’t enough consistent buyers. In October, the Institute published a report aimed at bridging that gap. It set out to identify 10 products that could be made with seaweed to appeal to American tastes. Researchers developed recipes like sea vegetable lasagna and pork and beans with sugar kelp and then did consumer testing. All 10 products ended up getting high marks from eaters, Crimp says. After dropping three more buoys to delineate all four corners of the new farm, Scali and Olsen start talking effusively about everything they’ve cooked with their kelp. Olsen shows off photos of a kelp berry crumble, kelp sloppy joes, and finally, a simple soup he made just a few days earlier (the last of which is the only dish that features visible seaweed). This is wonderful news! Hope this current administration and Congress are supportive of seaweed aquaculture. We could benefit from a true blue revolution. Maybe they'll be the focus of a follow-up piece. A great resource to learn more about seaweed farming and seaweed products is the Maine Seaweed Exchange-- www.seaweedexchange.com.